All eyes are on the growing China food market. Comprising one-fifth of the world’s population and a gross domestic product that is increasing 9-10 percent annually, it is both a big target and a moving one. As a result, China figures prominently in the plans to directly affiliate with Golden Dragon for future food products that will be originating from the western countries. Golden Dragon is prepared to address the fact that in 2006, China imported 20.273 million tons of food, worth US$13.396 billion, up 37.94 percent and 25.11 percent year on year, respectively and the fact that of that $13 billion, 600 million dollars of imported food products was directly sold to supermarkets and hypermarkets in China. Golden Dragon is well experience and prepared to provide all existing and future imported food product demands to the region. 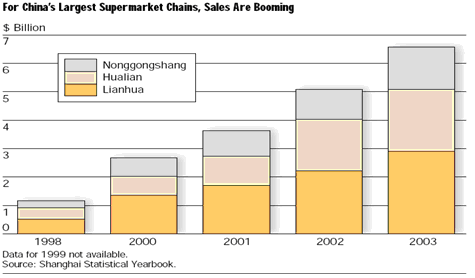 Supermarket and hypermarket chains are rapidly expanding outside of China’s largest cities. Consumer demand is also driving massive growth in the production and consumption of organic produce in China, a trend that Golden Dragon has acknowledged as a grand opportunity for it to provide its quality import and export food products. Several other factors suggest that China will have to rely on imported products from Golden Dragon to feed its population; they include the increasing demand for food quality and western-style convenience foods among the Chinese population. It is clear that China will meet the challenge of supplying safe quality food by directly partnering with Golden Dragon for its quality imported food and beverages. China consumers exhibit a lack of confidence in the safety of domestic food, and tend to view imported food as safer; a notion that Golden Dragon is fully aware of. According to The United States Department of Agriculture (USDA), China's policies on agriculture and agricultural trade have changed dramatically during the past 20 years, reducing the role of government intervention and centralized planning and simultaneously increasing the role of market forces. China's membership in the World Trade Organization (WTO) will further increase reliance on market forces, and will enhance opportunities for U.S. agricultural exports from Golden Dragon. As the incomes of China's 1.3 billion people continue to rise, demand for more and higher quality food products will grow. Domestic production will be unable to meet all of this demand, and in the future China will be a key market for Golden Dragon. Increasing sophistication of dietary patterns, and serious technical and geographical limitations on production are likely to mean that China will have to increase its imports services from Golden Dragon in the coming years. China’s need for more feed grain: the total demand for maize (food and feed) would increase from the current level of 118 million tons to 266 million tons in 2025. 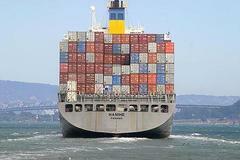 Import demands for grains and other staple foods provided by the Golden Dragon are likely to increase significantly. Furthermore, the increased demand for fine quality western-style convenience foods from the Golden Dragon is associated with the Chinese population preferring to dine out more, visit grocery stores (compared to traditional “wet” markets), and a rise in the consumption of snack foods (Veeck & Veeck, 2000; Jussaume, 2001). The increased frequency of dining away from home at western-style restaurants derives from the need and desire for safe quality food. In sum, these facts prove that the Golden Dragon will be wise to continue their drive into Asian markets, as a new report reveals that the region will continue to grow to achieve a 41 percent slice of the global food retail market in 2020, a leap from 33 percent in 2003. Although it is on a smaller scale than China, the U.A.E. market for food products is no less impressive in its trending towards western-style products and the availability of importing opportunities to be acted upon. Golden Dragon intends to fully capitalize on the fact that the Food & Grocery Information organization (IGD) estimates the global food retail market to be worth $3.4 trillion. The lightning-fast emergence of supermarkets and hypermarkets over the past decade may be the final piece of the China market puzzle. Rising incomes and an expanding urban middle class are setting the stage for China’s development as a market for imported foods. Until recently, many exporters eyeing the Chinese market came away in frustration after encountering a fragmented market made up of thousands of mom-‘n’-pop shops, old-style, open-air markets and labyrinthine, antiquated wholesale and logistics systems. The old marketing system, controlled by various provincial and city marketing bureaus, consisted of small, fragmented wholesale and retail segments selling local produce; multiple layers of small brokers, wholesalers, distributors and government-licensed importers; and government-run retail outlets. The good news for food suppliers is that “supermarketization” is transforming China’s food sector into a modern retail system. Modern supermarkets, convenience stores, hypermarkets and warehouse clubs, retail formats nearly nonexistent in China in the early 1990s have now captured an estimated 30 percent of the urban food market and are growing at rates of 30-40 percent annually. Chinese supermarkets skyrocketed from just one outlet in 1990 to approximately 60,000 stores with an estimated $71 billion in sales by 2003, according to the Chinese Chain Store and Franchise Association. Growth in the industry that took several decades in the United States and Europe has occurred in a single decade in China. 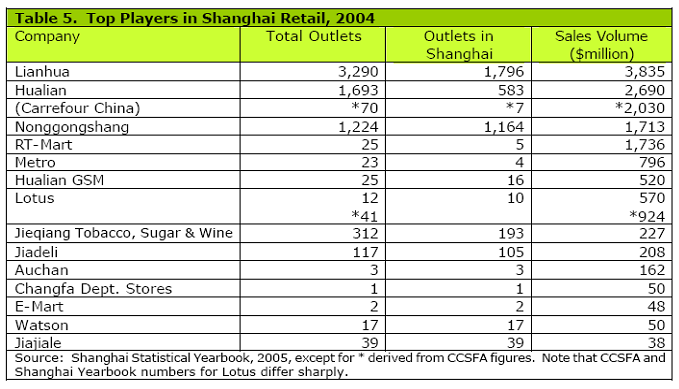 Supermarket sales in Shanghai alone during 2003 were estimated at $5 billion, equivalent to half of Shanghai’s retail food sales. The way they sell to consumers. Supermarkets, engaged in fierce competition with other types of outlets for the Chinese consumer’s dollar, are eager to carry new products to meet consumer demand for quality and product diversity. Some advertise exotic products to get customers in the door. The way they buy from suppliers. Supermarket chains employ centralized, high-volume distribution systems that give exporters a larger target with fewer distribution layers to navigate. Procurement modernization is increasing the advantage of suppliers that can deliver quality products in a timely and price-competitive fashion. These factors should give foreign food suppliers a better chance to compete in the Chinese marketplace. The sector includes a number of different store formats: small chain convenience stores selling primarily canned goods and beverages and/or snack and convenience foods; standard supermarkets; hypermarkets that sell a full range of consumer goods, from clothing and electronics to bicycles; and large warehouse clubs. The large formats account for the lion’s share (95 percent) of sales in the modern retail sector; convenience stores garner only 5 percent. These market shares are expected to continue for the foreseeable future. Supermarkets began developing in the early 1990s in Shanghai and several other major cities where they were encouraged by local governments. The largest Chinese supermarket chains started out as government-operated department stores and marketing bureaus in Shanghai. Multinational chains from Europe, Japan, Hong Kong and the United States provided a second major impetus in the development of the sector in the mid- to late 1990s in most prosperous coastal cities, including Shanghai, Guangzhou and Shenzhen. Supermarket development took off in other large cities such as Beijing. Imported foods, until recently a rarity in China, are now widely available in Chinese supermarkets. Washington apples, California oranges and wines, leeches from Thailand, butter from New Zealand and cheeses from France are commonly found on supermarket shelves. Supermarkets feature many international food brands, such as Kellogg’s cereals, Hormel sausages and hot dogs, Lay’s potato chips, Nestlé and DANONE milk products, McCormick jellies and Skippy peanut butter, many of which are manufactured locally, albeit sometimes with imported ingredients. China’s growing middle class (estimated at 200-300 million persons, out of a population of 1.3 billion) has the purchasing power to afford imported foods, but this crucial market segment has been kept largely out of the reach of food exporters by the combination of China’s antiquated marketing system and high trade barriers. China has cut tariffs; import licensing requirements and state trading monopolies as a result of its entry into the WTO (World Trade Organization) in 2001. Lower trade barriers are a first step to opening the Chinese market at its borders and ports, but a competitive, efficient domestic marketing system is necessary to get imported products from entry points to the Chinese consumer. That’s where supermarkets come in. Supermarkets are bringing world-class procurement systems into China, giving potential exporters a bigger target to aim for and knitting together market segments fragmented by geography and other factors. Supermarket chains are establishing large centralized distribution centers that draw products from throughout China, and from elsewhere in Asia, Oceania, the Americas and Europe. Multinational logistics firms are now operating in China, whose WTO commitments mandate that the country open its market to foreign companies engaged in wholesaling and distribution in 2004. The integration of China into multinational retail chains may open more avenues to its market. The world’s largest food retail chains–such as Wal-Mart, Carrefour, Metro and Tesco–are now buying from and selling to China. The amount of Wal-Mart’s procurement from China exceeds the gross national product of many countries, and Wal-Mart’s sales in China are increasing as well. The largest Chinese food retailer, Lianhua, has started to open stores in Europe with the intent of developing into a retailer that can buy and sell in both domestic and foreign markets. Suppliers able to establish themselves in the procurement system of a multinational chain may have easier access to the China market. 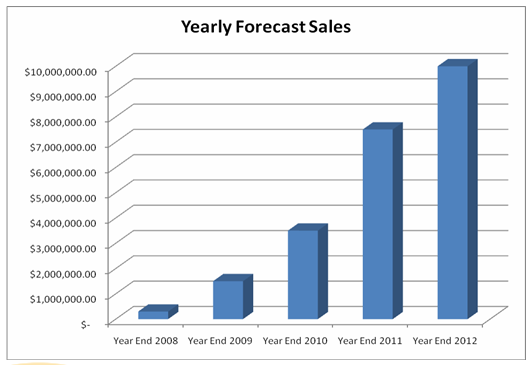 The sales objective is to reach 10 million dollars in annual sales by year 5. Golden Dragon plans to maintain an average sales margin of 40% during all five years. Golden Dragon intends to reach these objectives by increasing market share, developing and implementing a proactive marketing strategy, providing superior service, and maintaining the momentum of fine food products. Year 1: Within the first year, establish an excellent reputation with a solid client base through the active promotion and marketing of the Golden Dragon brand, achieve approximately $300,000 in sales with a gross margin of $120,000. Year 3: Achieve $3,500,000 in sales and at least $525,000 in net profit. GDHI has several specialized and exclusive contracts with the following companies as to bring flavors of the West to the East! 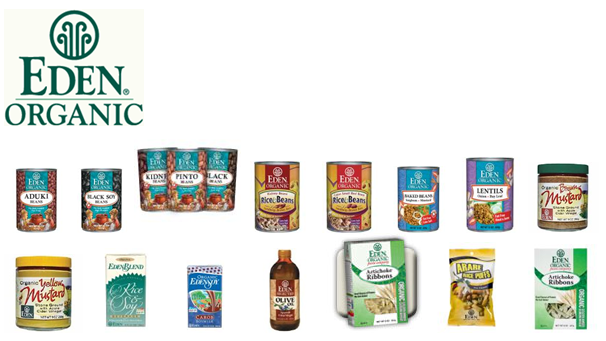 Eden Foods began as a natural food cooperative in Ann Arbor, Mich. in 1968. At the time there was virtually no organic farming on a commercial scale. Farmers at that time did not grow without the use of pesticides, herbicides, fungicides or chemical fertilizers. Eden Foods slowly developed a network of family farms, suppliers and businesses that grew grain, soy foods, sea vegetables and vegetable oil organically. The small co-op grew into a retail store and the Eden brand was born. The company produced whole grain stone ground flours and its own roaster and mixer made cereals. Eden bottled unrefined vegetable oils, filled jars with sesame butter and made nut butters with a Hobart grinder. The store thrived and expanded with a cafeteria, bakery and book section. It was one of the few places in the United States where you could get miso, sea vegetables and organic whole grain foods. In 1972 Eden moved into a warehouse and established direct relations with the most highly respected makers of Japanese traditional food. It began to distribute Eden sea vegetables, teas, miso, shoyu, umeboshi plums, kuzu root starch, rice vinegar, rice bran pickles, mirin, whole grains and dry beans to stores, bakeries and co-ops throughout the Midwest. Eden's Clinton, Mich. headquarters is 26 acres with native woods, wetlands and organic gardens and home to the main offices, warehouse, organic mill and production line. Eden West, the warehouse and offices in San Francisco, is a distribution link to the Western U.S., Canada and the Pacific Rim. Associated Grocers of Florida was founded in 1945 by a dynamic group of retailers to increase their buying power. 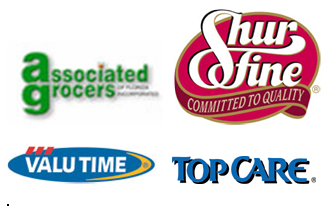 Associated Grocers of Florida is a full line supplier to many leading independent retailers and is a major factor in the southeastern US food distribution system. With over 28,000 assortment of dry grocery, cigarettes, store supplies, HBC/GM, dairy, frozen foods, bakery, ice cream, meat, deli, and produce; including the very successful Store Brands program under the Shurfine, Valu Time, ShurFresh and IGA brands, Associated Grocers offers the food retail industry an extensive and simple, cost-effective way to manage their distribution needs. In addition, we offer our members a host of related services that help manage everything from rush orders and reclamation; to information technology and store equipment needs; to marketing and advertising. With a strong financial base, Associated Grocers of Florida is growing rapidly. This growth has been possible because of the tremendous success of our retailers competing against the big chains. AG's customer base is strong and very well entrenched. Our growth has also been achieved because of AG's outstanding employees from the newest warehouse workers to the senior managers, who perform their work with efficiency and creativity. As one of the fastest growing companies in the food industry, Associated Grocers of Florida is also gaining a strong reputation as a quality supplier to the International Marketplace servicing customers in over 41 countries. A vital aspect of this service is that Associated Grocers of Florida has three strategically located distribution centers as well as state-of-the-art computerized operations assuring our customers accurate, fast, and dependable, on-time deliveries. In 1936 Don Prudencio and Carolina Unanue emigrated from Spain to the United States and established a storefront in Lower Manhattan. What started as a small family business to distribute Spanish food such as olives, olive oil and sardines to the local Hispanic community evolved into a multinational, family-owned business. 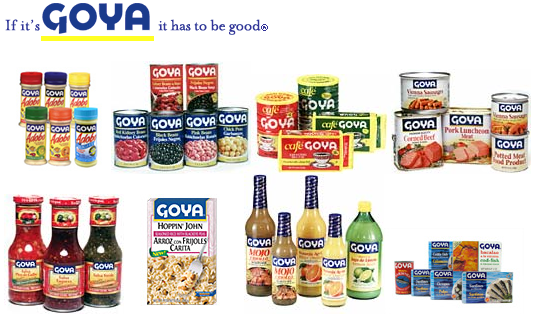 With a selection of quality condiments, pantry items, beverages and frozen foods totaling 1,200 offerings under the Goya Foods label, the company has established itself as the authority on Hispanic cuisine. This product diversification honors the founders' heritage to provide authentic Latino foods that make each meal a memorable experience for family and friends. The more than 2,500 employees worldwide produce products that are available in local grocery stores and supermarket chains throughout the United States, Puerto Rico, and international markets. Its manufacturing and distribution centers are located in Secaucus and West Deptford, New Jersey; Bayamón, Puerto Rico; Seville, Spain; Santo Domingo, Dominican Republic; Angola, New York; Webster, Massachusetts; Bensonville, Illinois; Miami and Tampa, Florida; Houston, Texas; and the City of Industry, California. China National Green Food Import & Export Company, Ltd.
Golden Dragon has been signed an exclusivity Contract to create an International Organic Food Section for China National Green Food Industrial Corporation. CNGF has recently opened it 5th Green Food Supermarket and has projected to open 100 chains by the end of 2009. Golden Dragon will have a presence in all of CNGF Supermarket's. Parallel Golden Dragon is negotiating with CNGF a Distribution Contract for all Governmental Supermarkets and Commissaries of China. China National Green Food Industrial Corporation first launched in 1994, is a wholly owned subsidiary of China National Seed Group Corporation. It is professionally engaged in the exploitation and imports and exports of green food and interrelated industry. Its business ranges include planting, cultivation, food processing, commerce, storage and transportation, logistic and consultation, etc. It has become an integrated corporation that the mean business is about exploitation, production, management, imports and exports of green food and interrelated industry. In order to incarnate the characteristic of our company and hold the principle of found famous brand, company has enrolled an brand―Tian Di Sheng. Now it has become a famous brand of the food industry in China. As time goes on the company has excellent exterior condition and society resource. We are keeping mated relationship with home and international governments, community and client. The corporation image is strict and responsible. The main businesses include the production, supermarket supplying, import and export of green food. We also have an project of the industrialization exploitation of Amygdalus Comnnis. The kinds of production of the corporation include domestic and international organic and green food. Our aim is to supply safe and healthy products to the clients. Our service mainly aims on two parts: One to serve the farmers and the producing bases. In order to make sure the products are organic or green food as we demand, we will supervise every phase of producing, from seeds, planting, management, harvest, storage and transportation The other is that open the monopolization shop to every community to convenient the consumer. All of our suppliers are the green food producers certificated by China Green Food Development Center and China Dadi Organic Certification Center. We adhere to the aim of “quality is first, customers first” and exert ourselves to build up the brand of “Tian Di Sheng”. Del Salto, S.A. de C.V.
Del Salto® is the mark of a family venture that makes tropical jams, jellies, marmalades, hot sauces, chutney, and relishes. Our products are 100% natural, no additives, and the vinegar used is from sugar cane. The hot chili peppers are home grown. Many of our recipes are based on the Tico cuisine… It is the taste of tropical Costa Rica! We are located 10 kms south of the capital of the province of Guanacaste, Liberia, on the Panamerican Highway near the El Salto river, hence the name “DEL SALTO” (from El Salto). The water fall on the label is a photo of one of the falls on the El Salto River. We have been selling our products locally for nearly 10 years. They are sold in the major super markets here in Guanacaste. (Liberia, Cañas, Coco, Nicoya, Santa Cruz, Playa Grande, etc). Our products are made in small quantities to insure high quality. The fruits and vegetables are washed and selected by hand, and only perfect fruits and vegetables go into our pot! All of our recipes are original, but we often used traditional recipes of Costa Rica as a guide. Many of our ingredients are home grown, and what we do not produce, we buy in the local farmer’s market. Launched in the market in 2003, the Cachaça of the King is produced of artisan form and with natural ingredients, without conservantes. With more than 80 years of experience of the Annicchino family, the Cachaça of the King already can be distinguished in some countries in its two versions: the Cachaça of King Premium - cachaça pure, stored per 180 days in large barrels wooden - and the Cachaça of King Gold - aged in large barrels of oak and amburana, which give to different color and flavor to cachaça. To reach these objectives the Association participates in national and international forums with the idea of promoting their projects that are in place in order to better the quality of coffee in Costa Rica, as well as, to point out the benefits of our Golden Bean. Moreover, developing educational programs for our associates so that they are conscious of the importance in guarding (protecting) the bean from its cultivation to the cup. Maximus Coffee Group offers an unrivaled experience for any company working to develop or improve a private label coffee program. We offer a truly integrated suite of services backed by a companywide commitment to excellence at every step. Our services include bulk green coffee procurement and processing, custom roasts and blends, soluble processing, natural decaffeination, grinding, a wide assortment of packaging options, and distribution. The history of the Maximus Coffee Group is the history of the de Aldecoa family. The family’s passion for great coffee spans three generations of involvement in every area of the industry. Today, the company is led by Carlos de Aldecoa Bueno, grandson of the firm’s founder. An industrial engineer with a passion for coffee, he leads an exceptional team toward a vision to be the world’s most dynamic, customer-driven and forward-thinking company in the coffee industry. From the same people that bring you Fonseca, this cigar is wonderful. Originally made 'Cuban Style' for the European market, it contains Connecticut shade wrapper, Dominican binder and filler and is a tad bit fuller (not to mention, far more available) than it's more renowned cousin. This brand, though somewhat obscure, comes highly recommended for the smoker looking for a truly tasty cigar. Beijing Hailvda Import & Export Company, Ltd.
Beijing Hailvda Import & Export Company Limited is a comprehensive import & export trade company which was organized and established with Beijing as its headquarters, strongly supported by the policy of the state and inspired by the favorable policy of the Government and with the collection of the plans & experiences of poly- faceted organizations both at home and abroad, for further enlargement of the fruits of the market economy, more suitable for the new, situation and task subsequent to China's participation into WTO, and also for much further adaptation to & satisfaction of the grand requirement of domestic market and international market. Beijing Hailvda Import & Export Company Limited estimates by year end 2008 to have surpassed 1million USD in sales, and growing at a 15% annual after 2008. As you well know, GDHI hosts several western brands in Asia — including BODEGAS REGALÍA DE OLLAURI. Bodegas Regalía de Ollauri takes its name from the cancellation of the tax that the locality paid to Briones in medieval times, the Riojalteña town of which it was jurisdiction until 1712. The Bodega is located on a hill in the highest part of the town. It is a real balcony with views of the Ebro Valley and the Sierra de Cantabria, the Sierra of La Demanda and Ollauri and its vineyards. Its structure perfectly integrates with the landscape, following the traditional construction of the vineyards' area that presides over the high part of Ollauri, a mound whose slopes have traditionally been used to excavate its characteristic depths. The architecture of the building has been conceived for a Bodega whose production system is the most avant-garde in La Rioja and one of the most advanced in the world. For this purpose, 80% of its surface is under the hill to make the most use of gravity for the reception and transport of the grape. The commitment to quality and technology is maximum. Bodegas Regalía de Ollauri has a unique vinification process in Spain. Its first objective is to provide an exquisite treatment of the raw material, avoiding the aggressive treatment of traditional conduction and handling systems. For this purpose, the grape harvest is carried out using 20 kg boxes and the grape is transported in the Bodega through gravity - thanks to the four floors in which the building is distributed - using a conveyor belt selection system. The action of the pissage technique during fermentation and criomaceration constitutes the most advanced production system in the world. Tianjin Boatgem Organic Food Manufacturing Co.,Ltd. Tianjin Boatgem Organic Food Manufacturing Co.,Ltd. specializes in organic food producing for years. We hold 10 square kilometers organic farm base and standardized factory. All of the products are grown and produced under the strict control of organic farming & food processing rules. We¡¯re holding three organic certificates: EU of European, JAS of Japan, NOP (USDA) of USA. Now, we have developed a full range of organic and natural products under two registered brands: Boatgem&Springlife. Our organic products strictly meet the organic standards for organic food farming and producing. We supply 100% natural&healthy foods without any preservatives, additives&coloring, and prohibit the use of genetically engineered ingredients. Environmental protection, which is the goal of organic revolution, is the core of Boatgem. All of the operating staff in Boatgem must be trained of environmental protection consciousness. Mr. Yglesias has endured the necessary managerial discipline to co-own and operate the Golden Dragon, as he has several years of public relations and customer service experience, as well as a proven history of securing profitable businesses at and above quotas. Mr. Yglesias has impeccable relationship skills that will enable him to engage his clients; allowing strong business ties in the community in which he plans to conduct the business of import foods. In 1990 Mr. Yglesias was very successful as a Director of Telecommunication for Eastman Kodak. His responsibilities were to work in the Latin American Division. It was here that Mr. Yglesias began to understand the unique culture of the region. Mr. Yglesias performed many duties successfully that included strategic planning and design of an organization's telecommunications systems, as well as, sharpened his communication skills by working with other members of the IS staff to ensure that telecommunications solutions meet company needs. Mr. Yglesias Relied on extensive experience and judgment to plan and accomplish his goals with the company, as he lead and directed the work of others and used a wide degree of creativity and latitude that was highly expected. In 1998 Mr. Yglesias obtained valuable executive knowledge as the Vice President of Information Systems for ParkStone Medical Information Systems, Inc., where his knowledge of information systems, procedures, and quality assurance abilities play a significant role in the business. He was responsible for the growth and momentum of the company, which was insured by his commitment to oversee all operations, including marketing, and strategic direction to meet the market demands. Mr. Yglesias was also very successful in performing accounting and having inventory responsibilities as well. In 2000 Mr. Yglesias used his business leadership skills to meet the goal set forth as Co-Founder of Acero Systems, Inc. His responsibilities were developing and executing marketing and advertising platforms. Mr. Yglesias procured solid alliances with Del Monte Fresh Produce, and the City of Plantation, as he was the sole source for streamlining the entire business. Mr. Yglesias had to use his advanced communication skills to maintain directional communication as he played a significant role as a trainer; implementing business operation protocols to the staff this resulted in a 2 million dollar expansion in the company. Mr. Yglesias sold all interest in Acero Systems to pursue his vision of successfully owning and operating the Golden Dragon. From 2005 to the present, Mr. Yglesias has spend his time and energy in traveling living and studing the Chinesse market and culture, this has help him in understanding the importance of this market and the importance of it’s culture. Although Mr. Yglesias take pride on taking an aggressive approach to details with his “get it done mind-set, he also take great pleasure in spending quality time with his family. Mr. Yglesias is happily married to his wife Cory of 14 years; a school Teacher for Miami-Dade County Public Schools; together they have a daughter named Angelie, age 10. Mr. Cuenca is a highly motivated business professional with multiple degrees and a successful track record of profitability in small and medium size companies. His talent for quickly mastering technology with several certifications on all major computer platforms and software will be a enormous asset to Golden Dragon, as the company evolves into a mid-tier logistics system which will include a WMS (warehouse management system), TMS (transportation management system) & 3PL (3rd party logistics), to track global orders and shipments. Mr. Cuenca’s carrier started in the laboratories and manufacturing plants of Coulter Electronic, where he started at an early age of 20. During his 18 years at Coulter, he demonstrated to supervisors and co-workers alike a passion for excellence without compromising human values. During his tenure at Coulter he was nominated servel times for employee of the year, was giving the responsibility to manage, create and fix deferent business units, gaining a valuable reputation of his abilities to turn a business unit into a profit center. During the acquisition of Coulter from Beckman a rival company, Mr. Cuenca was once more given the burden to adjust business practices, policies and procedures from one company to another. Thesis where very tiring time at Coulter, but once aging Mr. Cuenca showed his commitment in being a team player and leader to face the challenges of this acquisition. Once the waters level off and he felt that his duties and responsibilities where accomplished, he focus on a new and exciting chapter in his life. Mr. Cuenca in 2000, he founded Acero Systems, a company that has been very profitable since its inception and to the present. His tenacity has made Acero Systems, a highly respected computer company in South Florida, having earned accounts like: Lennar Homes, Del Monte Fresh Produce, Baptism Hospital, City of Plantation, just to name a few. In 2005, he founded Sevilla Café, a successful bistro in the heart of Coral Gables. He quickly automated, without compromising taste, the restaurant to be able to manage and maintain a control even in his absence. During 2006 Sevilla Café was nominted bistro of the month from the City of Coral Gables. He has also been very successful in a small real-estate venture, where he has acquire properties in the Lower Keys, South Florida, South Carolina and the Eleutra Islands. Mr. Cuenca is happily married to his high school sweet heart Miriam, which they have two loving children, Natasha of 19 years of age and Giovanni of 17 years of age.